My children are grown so I don't have any cute Halloween pictures ... sniff, sniff ... however, I thought I would post a scary puppy picture ...I love this! Okay, here is Daisy looking sweet as usual. I wanted to post some work I did last weekend at Jane's crop. For this layout I used my Mickey Font, Mickey & Friends, and Locker Talk cartridges with Design Studio to make my title "Character Spot". I really like how it came out and, even though you cannot see it, I love how the flash on the camera "pops" on the page. 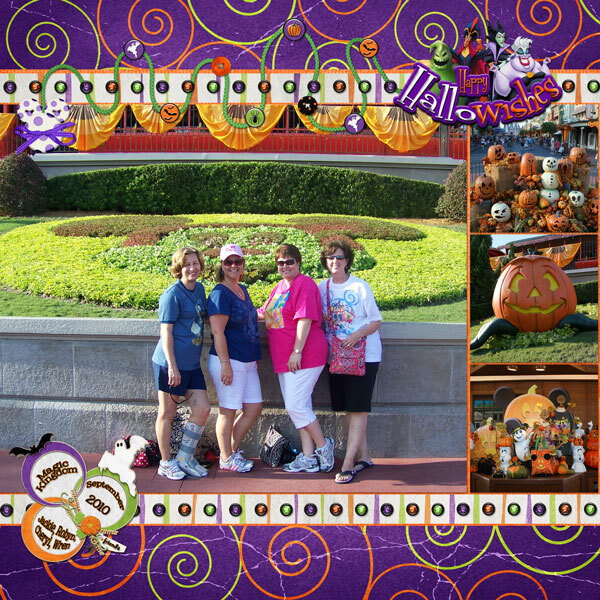 It, of course, is only complimented by the beautiful ladies from this year's Scrapper's Dream Event at Walt Disney World. If you click on the Scrapper's Dream Event link it will take you to the Dream Events website. They are currently upgrading and changing their website so you will not be able to see any of their events for 2011 yet. We are keeping a close eye on it though! This is the second page for this layout showing us with Goofy and Pluto! We were at Epcot. I had never been through The Character Spot before ... I will definitely be there again! I also got half of my Pirate layout done. I had fun finding my Tim Holtz mojo to make the top piece look like leather. I used his distressed inks and just kept crumbling it up and putting more ink on. It really did take on the look of leather. 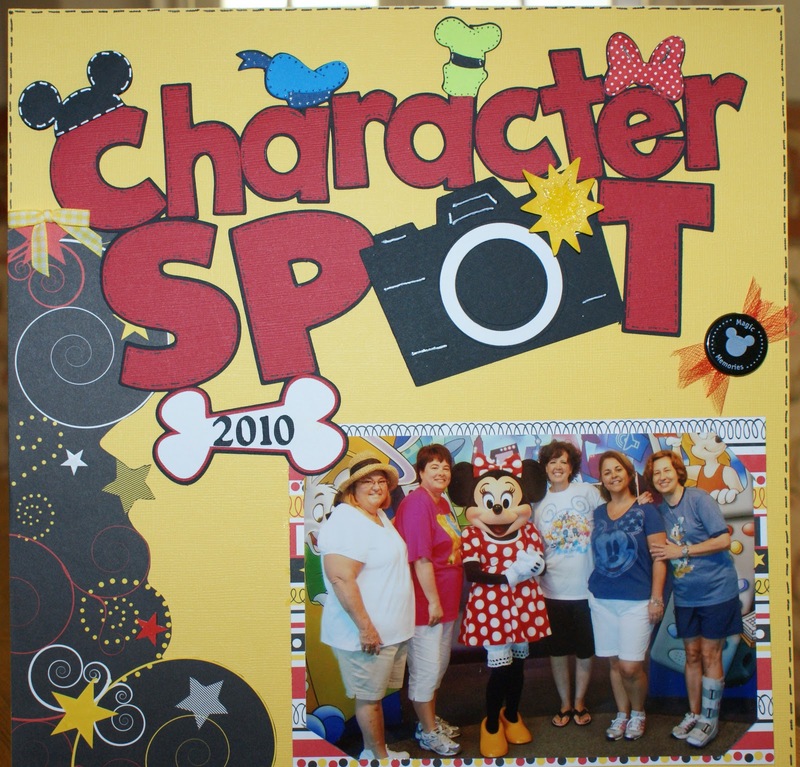 I also distressed the letters, photo corners and Mickey's hat. A close up will show you some fun I had using Photoshop Elements ... heehee ... I gave each of us a pirate hat, a tattoo, and sweet Jackie got an eye patch! This cast member at Pirates of the Caribbean was awesome and so funny! Thanks for looking and have a fun and safe Halloween! 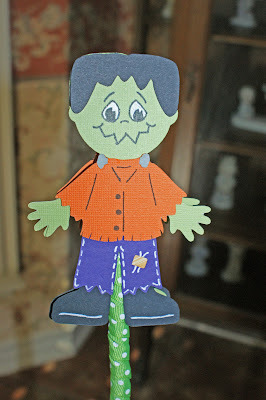 I'm off to the weekend crop at Jane's The Scrapbooking Factory. I haven't been to one in a few months so I am really looking forward to it! 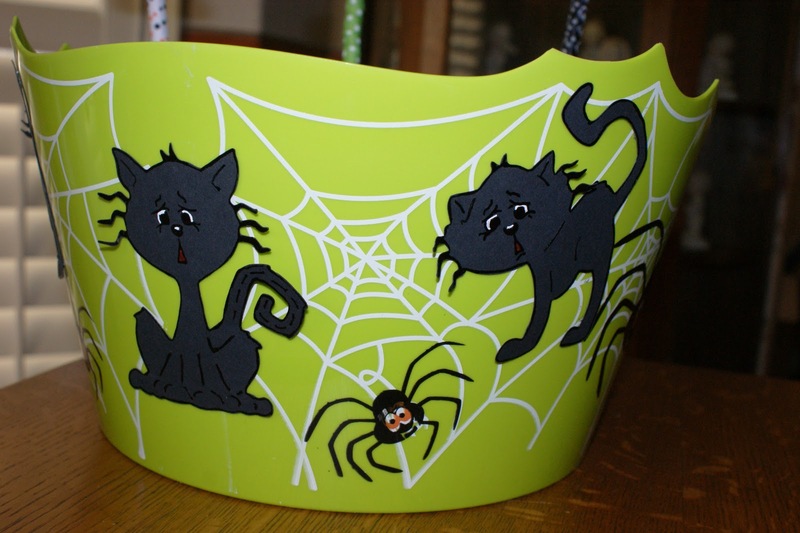 I've put together a candy bucket for everyone there. 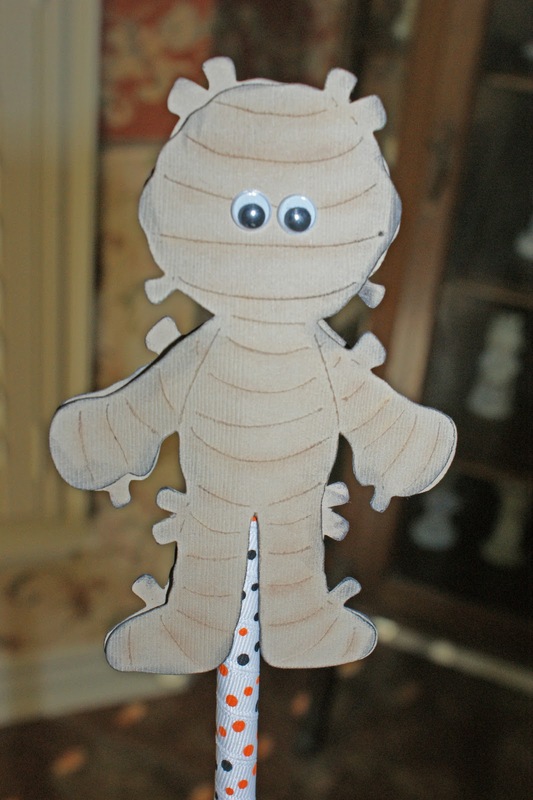 I used the Cricut Paper Doll Dress Up cartridge to make the cats on the bucket and the Dracula, Mummy, and Frankie. 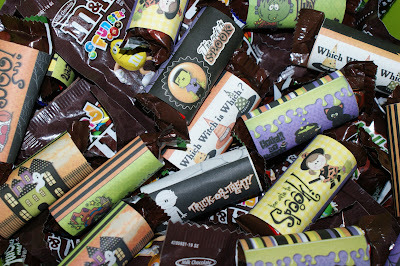 Here are some Halloween treat boxes I made for my sweet scrap buddy, Robyn, and two very special people. I also made some digital candy wrappers. It's been ten years since Curt and I have had a dog in obedience class and things have changed. I enjoyed watching Curt work with Daisy and was very proud of her. I was a little worried in the beginning because she was on overload ... seeing other dogs and they were so CLOSE ... must play with them!! We begin working with her tomorrow and, while it all seems to make so much sense when we are at the class, we hope we can hold her attention ... ha! 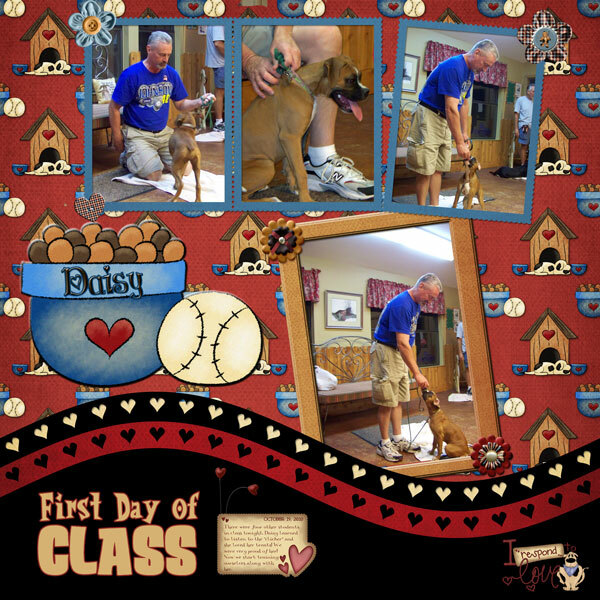 Anyway, here is my layout of Daisy's first day in class. 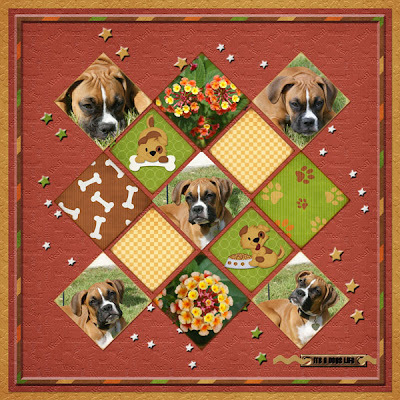 I used paper and elements from "Puppy Love" by Snickerdoodle Designs at Just So Scrappy. I also used "Clip Me Hearts" by Eva Kipler. Starting the week off with a Speed Scrap at MouseScrappers. I used "Hollywood Vacation" kit and Simple Dates Vol. 3 from Kellybell Designs. My title is "Glitter Alpha" at Just So Scrappy Too. 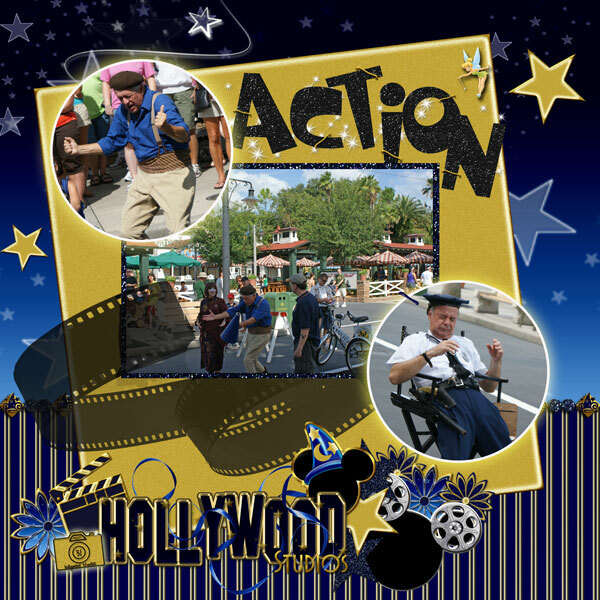 I just love the mini shows they perform at Hollywood Studios at Walt Disney World. I usually always stop to watch at least a couple each trip ... wonderful entertainment. I just finished this layout of Daisy. She recognizes the camera now and will just lay there. Don't know if she is posing or just telling me that she's not moving until the camera is GONE! I still got some cute shots of her enjoying the weather. I used a couple super cute kits from Just So Scrappy. I just found this site and it has some adorable digital kits there. I am using some more of their kits in the layout below. This layout is for a Weekly Challenge at MouseScrappers. This was such a fun challenge. All the things on your layout were determined by your date of birth and age. My layout was to consist of Polka Dot papers, Word Art and Ribbon Tabs, Live Animals, and Round or oval photos. I took some leeway on on the photos and presented all the photos in a curve so all of them would look like a quarter circle. I would also like to mention that these pictures were taken by Robyn on our Disney trip in August. She took some awesome shots on the safari at Animal Kingdom. I kept kidding her that the picture of the lion was not him roaring ... I think he swallowed a bug and is gagging ... ha! I'm just jealous cause I've NEVER seen the lion out when I went on the safari! Great pictures Robyn! I used "Who's at the Zoo" from Just So Scrappy and a paper from "Let's Talk Turkey". The template I used was "Sensational Single 4" by Janet Phillips. I hope everyone has a wonderful and relaxing weekend! Harry's World! 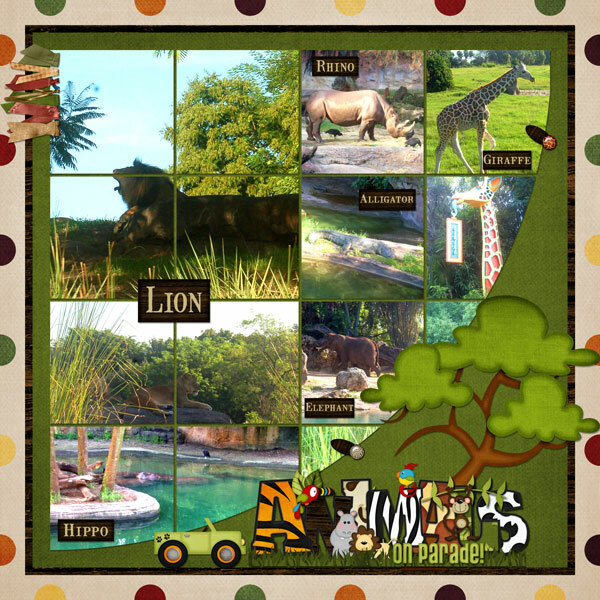 I created this layout today using several items ... the first is a brand new digital stamp set from Bugaboo Stamps. 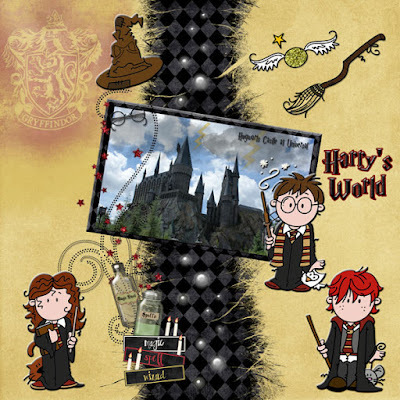 The stamp set is called Har Repotter ... too cute! I also used "Wizard School" by Traci Reed & Meghan Mullens, "After Midnight" by Jennifer Labre Designs, "Torn 3 Embellishment Template" by Diane L. Miller, and "Spellbound Embellishment Templates" by Syndee Nuckles. 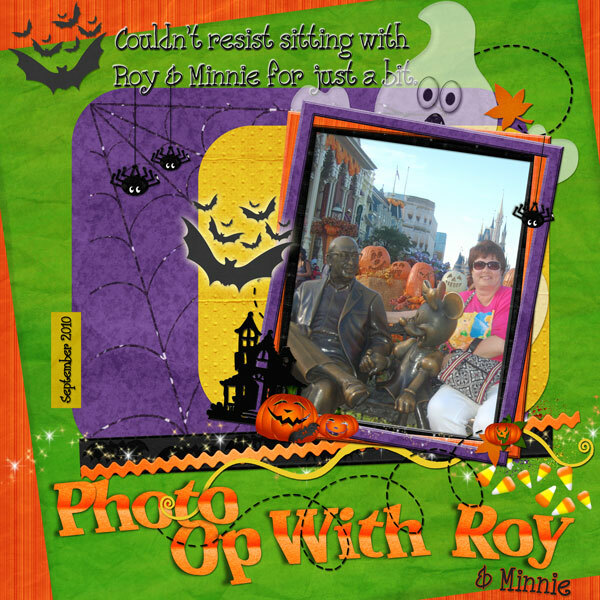 Oh, the picture was taken in August at the Harry Potter park in Universal Studios. I did change the picture up just a bit with adding the darker clouds and the lightening bolts! Don't you just love those cute digi stamps?? I have Harry, Ron & Hermonie, the Sorting Hat, Harry's Quidditch broomstick and the Golden Snitch on this layout.These are just a few of the stamps in this series that are available. See, it's not so scary, right? 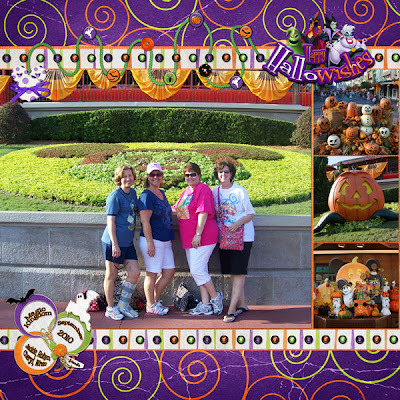 This layout is for a weekly challenge at MouseScrappers. I used a couple of kits for this layout ... "Spooktastic Kit" and "Frightful Kit" both by Natalie's Place Designs. She came out with three Halloween kits (the third is "Haunted") and you can get them all from the above link. These pictures are from my latest SDV scrap trip to Walt Disney World. 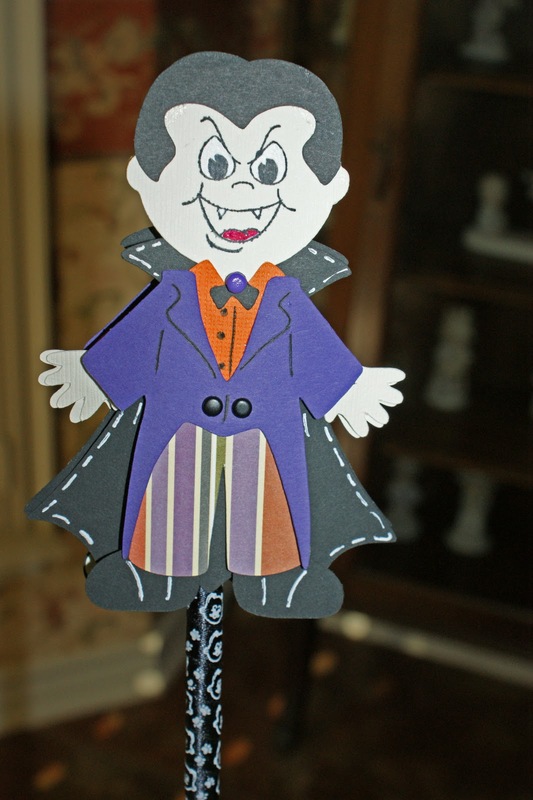 It is always so magical when all of a sudden the Halloween decorations appear ... ah, only at Disney! Have a fun weekend! Thanks for looking. I have been getting alot of the digital Halloween kits because I love Halloween colors! 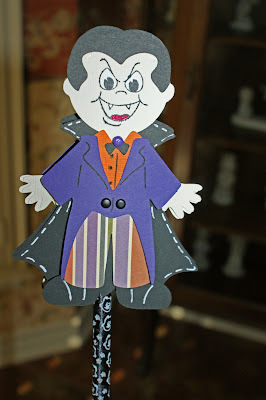 I'm not into spooky very much, but I had this great picture from the Haunted Mansion at Disney World that I wanted to scrap. I'm using a collaboration kit that just came out today from some great designers. It's called "Mansion Masquerade" by Britt-ish Designs, Studio Tangie, Sahlin Studios, and DeCrow Designs. I'll be back with more. There are alot of new Halloween kits being released! Well, happy October everyone! I'll start by saying that I'm not into Halloween at all, but I absolutely love the colors in the Halloween kits. 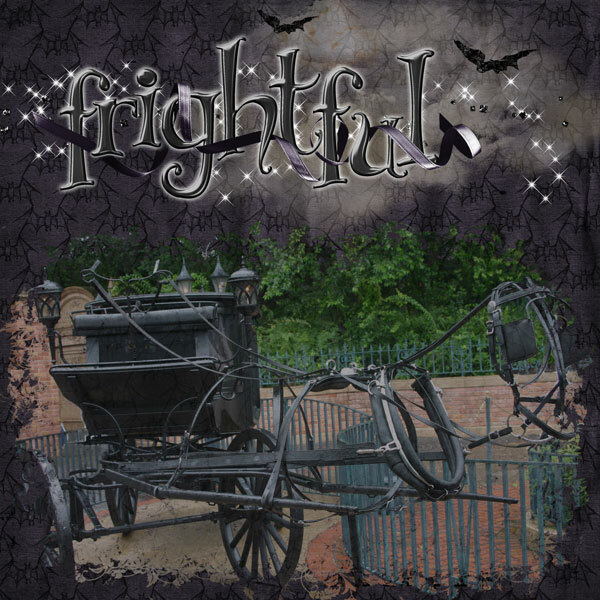 I'm enjoying designing my own blog and this month I'm using the digital kit "Boo-tiful Night" by Trixie Scraps and JennCK Designs. I also just finished a template challenge at MouseScrappers and for this layout I used the "Hollywood Vacation" kit and "Essential Disney" kit by Kellybell Designs. 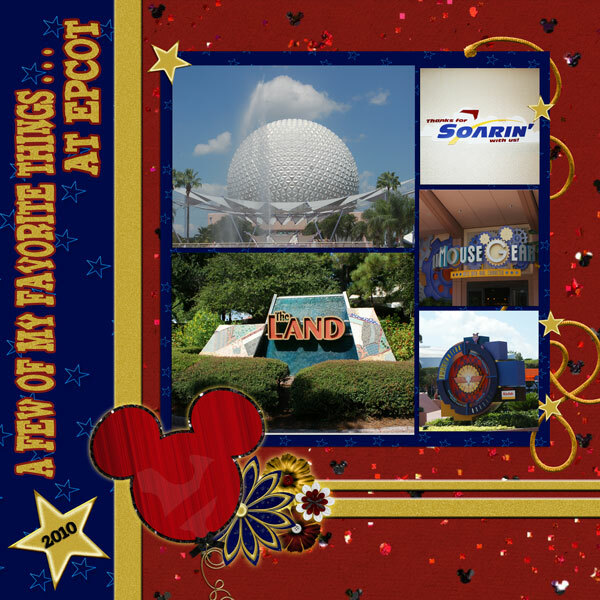 These are just a few of my favorite things at Epcot ... I have more favorite things there, of course!